When the Kansas territory was first mapped, the original Andover area was called Minneha. The Indian name was later changed to Cloud City. The first settlement in Bruno Township was in February 1869, when Vincent Smith arrived on Dry Creek (2 miles east of Andover Road on 21st Street). He filed his claim on May 10, 1869. Other early settlers began to arrive in spring 1870, and soon all the land was claimed. The first Bruno Township election was held April 9, 1872. The first township officers were N.B. Daniels, Trustee; Jacob Brown, Treasurer; J.D. Reber, Clerk; Isaac Newland and Samuel Reed, Justices of the Peace; William Riser and Isaac Stroup, Constables. Bonds totaling 18,000 dollars were issued for the extension of the Frisco Railway through Bruno Township. The railway was completed in 1880. G. M. Pattison homesteaded the land that became the original plot on which Andover was built. In August 1872, Pattison was given title to this property by president Ulysses S. Grant. In February 1876, the land was sold to Mr. and Mrs. Ephraim Waggoner. Andover's first church was what is known today as the United Methodist Church. The church started as a Sunday school in 1873. The original post office was established at Minneha (an extinct town) in November 1877. A branch was moved to 'Cloud City' in March 1880. That same year, the Cloud City post office was renamed Andover. Andover was named after Andover, Massachusetts. In January 1880, Mr. and Mrs. Waggoner deeded 40 acres (160,000 m2) to Charles Glancey. Mr. Glancey platted the original townsite in February 1880. The legally established townsite was known as Cloud City, named after Mr. Cloud, a well-respected citizen and railroad engineer. He helped build the St. Louis–San Francisco Railroad through town. The name of the town was changed from Cloud City to Andover on June 7, 1880, when Mr. Cloud had a 'falling out' with residents of the area. A trading post which sold all types of merchandise was the first known business in Andover. The first hotel was operated in 1881 by J. C. Lines. The front part of the hotel was a general store operated by G. W. Harris. In 1882, the Richland school house was moved to the present Meadowlark Elementary School location at a cost of 2,000 dollars, and became the city's first school. Professor Haskin was the first principal and enrollment was 86 students. Early businesses during the 1882–83 period were a hotel, a grocery and lumber company, a shoemaker, a business that handled livestock, coal and grain, a general store, a meat market, two other grocery stores, and the railway agent. In 1883, the population of Andover was about 150 people. The first passenger train went through Andover in 1885 and the last passenger train in October 1960. The best known historical event was a train robbery at 10:00 P.M., on July 17, 1898. After being forced to flag the train, Depot Agent S.B. McClaren escaped and ran to the nearby Methodist Church—where an ice cream social was being held—to spread the alarm. Will Belford, 28 years old, was shot while trying to stop the bandits and died five weeks later. The robbers escaped, but were captured on August 12, 1898, in Maize, Kansas. Both were tried in Butler County Court. Sam Smith was charged with first-degree murder and hanged. Thomas Wind was charged with second-degree murder and sent back to prison. The class of 1914 was the first class to graduate from Andover High School. The class of four students to receive diplomas were Josie Boyer, Virgil Grier, Ola Peacock, and Perry Hiskin. The school itself started in the fall of 1909 as a consolidated school which had been formed by combining four school districts, and qualified as an accredited high school. Andover did not incorporate into a third class city until February 4, 1957. The population of the city proper was 166. Up until this time, Andover was a small unincorporated community surrounded by farmland. Homes began to spring up south of the original townsite. At the first city election on April 2, 1957, Hugo Epp won by one vote over Charles Clay for the position of mayor. The form of government is mayor-council, with the mayor elected every four years, and five council members at large every two years. Robert Dodge was elected Police Judge. Councilmen elected were Roy Allison, Orland Wolf, Ual Baker, Roger Moore and Clair Mohler. A major annexation in 1968 not only increased the area of the city, but the population grew from 500 to 2,000. The first Greater Andover Days Celebration was held in 1967. Andover has two golf courses within a mile of each other and one in the southernmost part of the city that, in 2005-2006, was rated the 43rd best golf course in the country by Golf Digest Magazine..
On April 26, 1991, the F5 Andover tornado left a trail of destruction through parts of Kansas, including south Wichita and Andover. Widening to nearly one-half mile, with winds over 250 mph (400 km/h), the deadliest blow was to Andover. The twister ripped through the town killing 13 residents. A third of the 4,300 residents were left homeless. Over 300 homes, 10 businesses and two churches were destroyed. The Golden Spur Mobile Home Park and the St. Vincent De Paul Catholic Church were leveled. In 2000, Andover passed a bond issue allowing the school system to double in size. Andover grew to two high schools, two middle schools, and 4 elementary schools. Andover High and Andover Middle both use the Trojans as their mascot, sporting blue and white for their colors. Andover Central High and Andover Central Middle are the newer of the schools, established in 2001. Their mascots are the Jaguars and school colors are black and gold. Both schools have outstanding athletic, academic, music, drama, and art programs. Four schools; Cottonwood, Meadowlark, Robert Martin and Sunflower have been the Elementary buildings serving the community. In 2005, Andover residents approved in bond election to build three additional elementary schools. The first of which, Robert Martin Elementary, which was named after Robert M. Martin, moved from a shared building with Meadowlark into a new location in the fall of 2007. The remaining two new buildings opened in the fall of 2008 as Wheatland Elementary and Prairie Creek Elementary. In 2005, Andover passed a sales tax increase to contribute to the building of a new Andover Public Library. The new Library was constructed at Andover's Central Park, ground breaking was in late summer 2007. 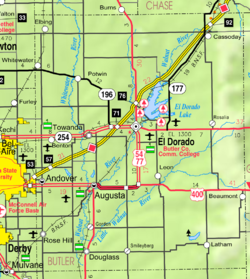 Andover is located at 37°41′28″N 97°8′13″W﻿ / ﻿37.69111°N 97.13694°W﻿ / 37.69111; -97.13694 (37.691165, -97.137043). According to the United States Census Bureau, the city has a total area of 10.04 square miles (26.00 km2), of which, 9.99 square miles (25.87 km2) is land and 0.05 square miles (0.13 km2) is water. It is located in Butler County, Kansas, the largest county in Kansas. Butler County is larger than the state of Rhode Island. Andover has two public parks, Andover Park and Andover Central Park. Andover is part of the Wichita, KS Metropolitan Statistical Area. As of the census of 2010, there were 11,791 people, 4,036 households, and 3,129 families residing in the city. The population density was 1,180.3 inhabitants per square mile (455.7/km2). There were 4,233 housing units at an average density of 423.7 per square mile (163.6/km2). The racial makeup of the city was 93.0% White, 1.0% African American, 0.6% Native American, 1.8% Asian, 0.1% Pacific Islander, 0.9% from other races, and 2.5% from two or more races. Hispanic or Latino of any race were 4.8% of the population. There were 4,036 households of which 49.1% had children under the age of 18 living with them, 63.0% were married couples living together, 10.3% had a female householder with no husband present, 4.3% had a male householder with no wife present, and 22.5% were non-families. 19.6% of all households were made up of individuals and 9.6% had someone living alone who was 65 years of age or older. The average household size was 2.89 and the average family size was 3.34. The median age in the city was 33.7 years. 33.7% of residents were under the age of 18; 6.2% were between the ages of 18 and 24; 27.6% were from 25 to 44; 23.6% were from 45 to 64; and 9% were 65 years of age or older. The gender makeup of the city was 48.4% male and 51.6% female. As of the census of 2000, there were 6,698 people, 2,274 households, and 1,766 families residing in the city. The population density was 978.0 people per square mile (377.5/km²). There were 2,456 housing units at an average density of 358.6 per square mile (138.4/km²). The racial makeup of the city was 95.13% White, 0.52% African American, 0.55% Native American, 1.05% Asian, 0.01% Pacific Islander, 1.03% from other races, and 1.70% from two or more races. Hispanic or Latino of any race were 2.39% of the population. There were 2,274 households out of which 48.4% had children under the age of 18 living with them, 64.6% were married couples living together, 9.2% had a female householder with no husband present, and 22.3% were non-families. 19.5% of all households were made up of individuals and 8.2% had someone living alone who was 65 years of age or older. The average household size was 2.86 and the average family size was 3.30. In the city, the population was spread out with 33.4% under the age of 18, 6.3% from 18 to 24, 30.0% from 25 to 44, 19.9% from 45 to 64, and 10.5% who were 65 years of age or older. The median age was 34 years. For every 100 females, there were 92.3 males. For every 100 females age 18 and over, there were 87.3 males. The median income for a household in the city was $57,163, and the median income for a family was $65,781. Males had a median income of $50,326 versus $30,683 for females. The per capita income for the city was $24,818. About 6.2% of families and 6.3% of the population were below the poverty line, including 6.9% of those under age 18 and 11.6% of those age 65 or over. ^ "Subcounty population estimates: Kansas 2000-2007". United States Census Bureau, Population Division. 2009-03-18. Archived from the original (CSV) on 2008-09-26. Retrieved 2009-04-04. ^ "Kansas Post Offices, 1828-1961, page 2 (archived)". Kansas Historical Society. Archived from the original on October 9, 2013. Retrieved 5 June 2014. ^ "Profile for Andover, Kansas". ePodunk. Retrieved 5 June 2014. ^ "Ty Masterson's Biography". Retrieved 2016-04-06. ^ "Kevin G. Schmidt". IMDb. Retrieved 2016-04-06. Wikimedia Commons has media related to Andover, Kansas.